Professor Shirley Alexander, UTS Deputy Vice-Chancellor, welcomed the delegates and talked about the UTS Bachelor of Technology and Innovation (BTI), being introduced next year. This is a general degree in technology, suitable for those going into business. I am skeptical of the idea of a BTI as the 21st Century replacement for the arts degree. BIT graduates may end up like arts graduates: well educated, but not qualified for any real job. 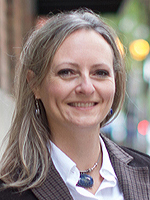 Marguerite Koole Assistant Professor, Curriculum Studies at University of Saskatchewan described applying a frame model of learning (Koole & Ally, 2006). Kevinwâsakâyâsiw Lewis, then talked about the teaching of teachers of indigenous languages in the University of Saskatchewan's Certificate in Indigenous Languages. Asked about the relevance of song in language learning, Kevin pointed out that chant and song enables the learner to stop worrying about how they pronounce. Also the repetition in the song helps learning, as well as being culturally significant. This reminded me of Dr McComas Taylor, at ANU's Teaching Sanskrit online with chanting. Philip Townsend talked on "A Theory of Enhancement of Professional Learning for Aboriginal and Torres Strait Islander Pre-service Teachers in Very Remote Communities through Mobile Learning". He pointed out that Aboriginal and Torres Strait Islanders have a much lower completion rate than the general population. The Community Based ITE program, specifically for students in remote areas, has an even lower completion rate than other forms of education. Philip has devoted his PHD research to finding if mobile devices can improve completion rates. Also he mentioned the Cooperative Research Centre for Remote Economic Participation. I suggest that addressing the needs of remote students can assist all students. If we make courses flexible enough for the remote students, these courses will also be better for city and campus based students. Philip was awarded top paper at the conference. Anthony Chung from mobileLearning gave one of the more practical and less academic (in a good way) sessions on "How does a Mobile Platform Address TEQSA and Other Regulatory Compliance for Online Courses?". Anthony went through some of the TEQSA requirements and how these could be facilitated with mobile devices. What was interesting about mobileLearning's approach is that they provide mobile interface to the institution's native educational applications, rather than replace them. The idea is to make it easier for students and staff to do what is educationally useful. One example is to encourage the student to engage with the learning. This can be difficult where a Learning Management System (LMS) design for static desktop pages is used. The mobile interface can make it easier to access the materials and interact. Susi Steigler-Peters, from Telstra Corporation talked on "Personalised Learning, mEducation and Partnerships". Susi spent most of the time describing research on education Telstra has funded over the last few years. This research sounds well designed, but does not tell us, as educators, anything new. So I asked Susi how Telstra could help improve education. In response she cited something called "Telstra Smart Learning" and presented a use case of a student named "Ferris" having an "enriched learning experience". Susi also mentioned a center to be established in Sydney for education. It might be useful for Telstra to instead showcase some of the work in their muru-D startup accelerator. Norman Wildberger and Joshua Capel presented an excellent live demonstration of "Higher Education Practice Online Tutorials and GeoGebra as Mobile Learning Tools" used for teaching mathematics at UNSW. However,what seemed to be missing was a business model to support the high up-front investment to produce such material. Elizabeth Angstmann talked on "Higher Education Practice Using a mobile Moodle app in an online physics course". This shows an approach to education which focuses on ensuring that e-quality education can provide quality education, backed up by solid research. Professor John Traxler, University of Wolverhampton gave the last keynote on "The Role of Education in Identity Transformation and Acculturation". Professor Traxler challenged the assumption that m-learning (and education in general) was a culturally neutral boon for developing nations. Rather than telling us a canned answer, this was a presentation asking questions, which was refreshing. Louise Patching, USQ, talked on "Using Offline Personal Devices to Enable Access to Higher Education in Prisons" for the Making the Connection Project. Louise pointed out that lack of Internet access is only one factor limiting e-learning in prisons; also there is limited access to hardware, limited prior education of the students. She explained that USQ had decades of experience in teaching prisoners. USQ has a special server for providing materials to prisons and a way for materials to be loaded to portable devices. Some of what USQ has done would be useful, more generally for students. For example, a problem with webinars is where students have inadvertent left their microphones turned on. I suggest that the off-line features could be built into Moodle and the Linux operating system, allowing the approach taken by USQ to be made available world-wide at no cost. Lisa O’Neill, York University, talked on "Encouraging Faculty Development Through Micro-Credentialing". This presented a good overview of the mechanics of recognizing small units of learning with "badges". However, what is also needed is a way to motivate university academics to learn to teach and undertake activities which award such badges. Greetings from mLearn 2016 at UTS in Sydney, where Elizabeth Angstmann talked on "Higher Education Practice Using a mobile Moodle app in an online physics course". This was the best presentation from the conference so far (and a second good presentable from UNSW). This shows an approach to education which focuses on ensuring that e-quality education can provide quality education, backed up by solid research. This is more likely to provide benefits for Australian education (and for the Australian economy), than Telstra's unsubstianted promises of being able to help with education at some unspecified time in the future. Greetings from mLearn 2016 where Norman Wildberger and Joshua Capel presented an excellent live demonstration of "Higher Education Practice Online Tutorials and GeoGebra as Mobile Learning Tools" used for teaching mathematics at UNSW. However,what seemed to be missing was a business model to support the high up-front investment to produce such materials. The Open University (OUUK) pioneered the use of video and preprepared materials decades ago. What OUUK also did was work out the costing of preparation of such materials and tradeoffs between production values of video and teaching effectiveness. Many educators appear to be reluctant to address cost and consider this is not their role. However, if these forms of education are not cost effective, then they will be no more than one off experiments. Before carrying out research in this area, I suggest reading the excellent series of books produce by OUUK, some decades ago on how to produce education. This work is as applicable today to the MOOC. 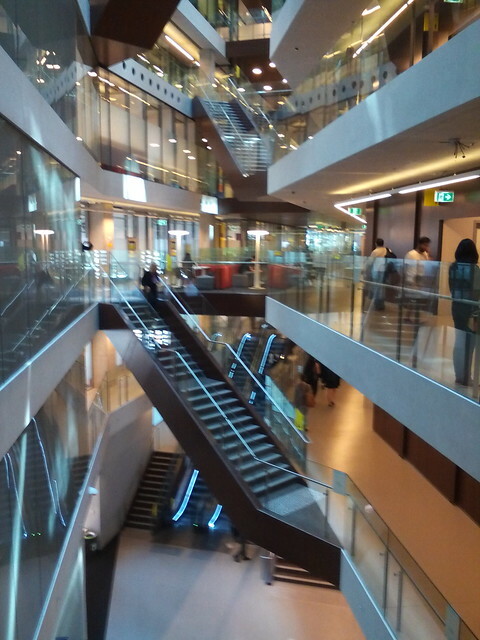 Today I have been attending the 15th World Conference on Mobile and Contextual Learning (mLearn 2016) at the UTS Engineering and IT Building, University of Technology Sydney. The building is only two years old and is a good example of a modern, large scale higher education building. Each teaching room has a display screen outside showing what sessions are booked. This is useful, but one problem is that the small teaching rooms have heavily frosted glass panels onto the corridor, so it is not possible to see if there is anyone actually in the room (the large lecture theaters have clear panels). The large lecture theaters provide mains power points for each student. These are hidden under the desk and a bit hard to find, but work well. The student desks are fixed with chairs on wheels and a generous amount of space. On problem is that the ceiling lighting extends down the walls on each side, creating glare. The small teaching rooms have flip up tables on wheels, for flexibility. All the rooms have the same standard teaching station, with computer and document camera. My laptop switched to HDMI output and I needed an external monitor to switch back. Wandering around the building looking for a screen I found a student study room with two technical support staff. They found me a spare screen and I was able to get my laptop going. There is also an excellent cafe in the building, which is used for informal teaching as well as socializing. However, this building is not perfect. There are no large flexible teaching spaces in the building (at least none I could find). That is rooms with flat floors, for one hundred, or more, students. The building has many teaching spaces, but these are either small, or have stepped floors (and so are fixed in use). Greetings from the AGM of the International Association for Mobile Learning (IamLearn), held in conjunction with their annual conference mLearn 2016 at UTS in Sydney. Because I registered for the conference I received a year's membership. This is a relatively small academic association. One initiative is that a new website will allow members to add content directly, rather than emailed to an officeholder who then puts it up. This is something other organizations might like to try. 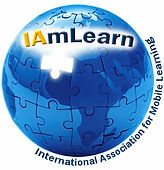 IamLearn is also creating an eBook on mLearning. Greetings from mLearn 2016 at UTS in Sydney, where Anthony Chung from mobileLearning gave one of the more practical and less academic (in a good way) sessions on "How does a Mobile Platform Address TEQSA and Other Regulatory Compliance for Online Courses?". Anthony went through some of the TEQSA requirements and how these could be facilitated with mobile devices. What was interesting about mobileLearning's approach is that they provide mobile interface to the institution's native educational applications, rather than replace them. The idea is to make it easier for students and staff to do what is educationally useful. One example is to encourage the student to engage with the learning. This can be difficult where a Learning Management System (LMS) design for static desktop pages is used. The mobile interface can make it easier to access the materials and interact. Other sessions at the conference took a different approach, arguing that students spend their time in social media websites so the learning needs to happen in those social media applications. I have concerns as to the privacy and distractions for the student, as well as the difficulty to continually adapting the learning materials for whatever is the current social media platform. It would be possible to build a LMS interface to social media, and a default mobile interface outside the platform, but there would still be a very high privacy risk due to the social media interface. Greetings from mLearn 2016 at UTS in Sydney, where Philip Townsend is speaking on "A Theory of Enhancement of Professional Learning for Aboriginal and Torres Strait Islander Pre-service Teachers in Very Remote Communities through Mobile Learning". He pointed out that Aboriginal and Torres Strait Islanders have a much lower completion rate than the general population. The Community Based ITE program, specifically for students in remote areas, has an even lower completion rate than other forms of education. 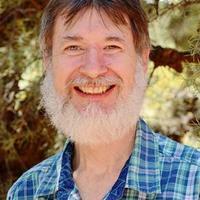 Philip has devoted his PHD research to finding if mobile devices can improve completion rates. Philip pointed out that indigenous students have cultural obligations which can take them away from their studies for extended periods. A mobile device may assist, but who pays for the device and network access? In a remote indigenous communities prepaid access is typically used and the account may be shared with others. Also the institution has to offer an on-line strategy as part of the education. One important points was that Philip asserted that mobile devices are compatible with indigenous communities: this is not a technology which will be abandoned after the novelty wears off. Also he mentioned the Cooperative Research Centre for Remote Economic Participation. I suggest that addressing the needs of remote students can assist all students. If we make courses flexible enough for the remote students, these courses will also be better for city and campus based students. For the last four years I have been an on-line distance education student and have been teaching this way for seven years. To me this is just normal education, which can be enhanced, where possible, with supplementary face-to-face classes. Greetings from the Australian Academy of Science Shine Dome in Canberra, where the finalists in the Innovation ACT competition are giving their pitches to a panel of judges. One team which stood out was Pixelated Induction (PI) with large scale inductive charging. PI claim to be able to deliver standard wireless charging for mobile devices, but on a scale suitable for airport lounges and cafes. It occurred to me that one launch customer could be the military and other safety and security organizations, who need to have charged devices ready at all times. In 1996 I took a helicopter ride into the Coral Sea where USS Blue Ridge, was coordinating a joint US-Australian exercise. Personnel arrived on-board, like me, put their portable devices on long benches and then tried to get power so they could run the exercise. The result was a tangle of wires. Wireless charging would make this a bit easier. Another IACT project with military and security application is Wildlife Drones. These are small robot helicopters (UAVs), with directional radio antennas. The drones automatically track radio tags attached to wildlife. The same technology could be used by the military to search for terrorists, improvised explosive devices and locating friendly forces. Drones could be launched from the ground, ship or aircraft. Wildlife Drones also need to consider how their technology could be misused: equipped with explosive and programmed with a mobile phone ID, the drone becomes an autonomous flying bomb, which will search for the phone and then detonate. There are two new publications on e-learning from Canada. The first, Learning in the Digital Age, a report by Michael Grant for the Conference Board of Canada (October 2016) is about why use e-learning and also why it is not happening as much as it should. The second is "Emergence and Innovation in Digital Learning: Foundations and Applications", a book edited by George Veletsianos, available free on-line from Athabasca University Press (May 2016), about how to get e-learning to happen.